Telling the future is a gift: you either have it, or you don’t. And Mira, daughter of the famous fortune teller Madame Mirabella, just doesn’t. When Madame gazes into the crystal ball, magic swirls. When Mira looks . . . nothing. Then one day Mira gets a pinwheel and a windsock, she finds her own form of “magic” in the science of predicting the weather—and saves the day for everyone! This engaging tale, with a fun touch of science thrown in, helps kids understand that we all have our own special talent. I’m a Belmartian by marriage, which means I claim the beach town of Belmar, NJ, as a home. During Superstorm Sandy, Belmar’s boardwalk was destroyed, and many homes were damaged or demolished. 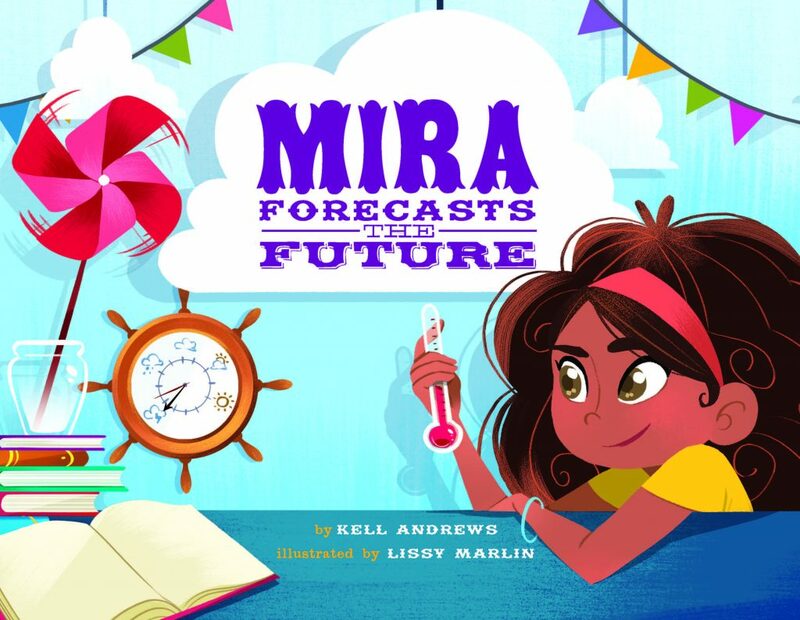 Sandy, storms, boardwalks, fortune tellers — they all came together in Mira Forecasts the Future, the story of the daughter of a boardwalk fortune teller who can’t see the future with magic, so she learns to predict the weather with science. Mira learns about weather, and this book is the story of a girl who saves a surfing contest and the day. It doesn’t take place in the present or in the past, despite Lissy Marlin’s gorgeous Boardwalk Empire inspired ilIustrations, but somewhere in between. It doesn’t take place in New Jersey — it could be Coney Island, Santa Cruz, or any beach town. Boardwalks and beach towns seem like tourist traps to those visiting, but there are real people who live there. I wanted to capture a warm small-town environment — flavored with salt water taffy and pizza by the slice, soundtracked by calliope music and the crash of waves. Kell Andrews, author of Mira Forecasts the Future. In Mira Forecasts the Future, I mixed together facts and fiction, and not just about the weather. There was a real Madam Marie, Marie Castello, who told fortunes on the Asbury boards, just as her granddaughter still does. Madam Marie was never arrested, so the fortunes she told must have come true. There isn’t a real Mira. I hope instead there are a lot of them — kids who learn to use science to learn about nature, forecast the future, avert disaster, and make the world a better place. 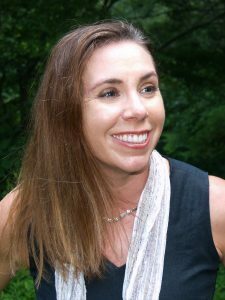 Visit Kell Andrews’ website here to find out more about the author, book signings and more. Visit illustrator Lissy Marlin here. Get your copy of Mira Forecasts the Future (Sterling Publishing; $14.95, Ages 5-8) at B&N or your local independent bookseller today.